If you like your bike with a sleek, harmonious look there's no need to compromise anymore: LightSKIN is a seat post and tail light in one - and the new model is road legal in Germany according to StVZO laws. We reworked this model together with LightSKIN: the battery is now embedded into the seat post and rechargeable via Micro-USB. Removing the seat post is not necessary as the USB-port is located at the seat clamp. A charging cable is included. The LightSKIN seat post has five bright, glare-free LED lights, which makes you visible from all sides. 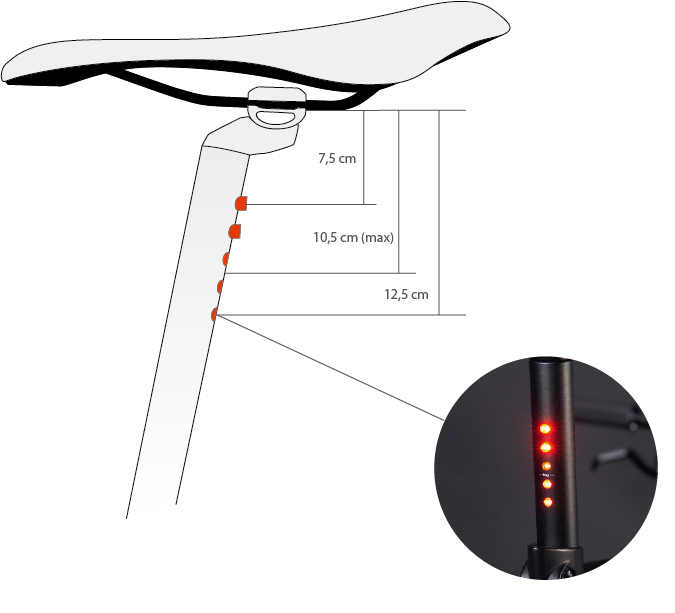 The two bottommost LEDs can be turned off and lowered into the seat tube, depending on your height and frame size, to save battery. A run time of 10 (5 LEDs) to 15 hours (3 LEDs) ensures many illuminated rides by night. Durable, weatherproof, anti-theft - a compact and safe tail light with a stylish, minimal design. The new road-legal LightSKIN seat post is available in black, white and silver, with circumferences of 25.4 mm, 27.2 mm and 31.6 mm. The standard length is 350 mm, a Bullitt-Version in the diameter of 31.6 mm with a length of 400 mm is also available. For Siegfried, Viktor, Hektor, Ludwig and Lotte models you’ll need the 27.2 mm diameter option and for the ThinBike, choose 31.6 mm. For sizes in between you can ask for adapters at any bike shop. The seat post should be mounted so that at least the three uppermost LEDs are visible, thus it sticks out of the frame at 10,5 cm.